This Virtual Battlefield Tour presents the locations of the numerous commemorations in Europe to the men of the 1st Infantry Division. The US 1st Infantry Division is the oldest division in the United States Army with units dating back to the American Revolution. It was the first American unit to arrive on the First World War battlefield. Units of the division fired the first artillery shot of the American Expeditionary Corps and suffered the first three soldiers killed. In 1918 it launched America’s first offensive operation against the Germans at Cantigny. In September the entire division was committed in the Battle of the Mihiel Salient and only two weeks later in the decisive Meuse-Argonne Offensive where it fought as far east as Sedan. The unit insignia provides its nickname as well, a ‘Big Red One’ on a brown/ grey background. The fields and forests northwest of Verdun, bordered by the Meuse River on the east and the Forêt d’Argonne on the west, were the scene of the most intense fighting experienced by American forces during the First World War. 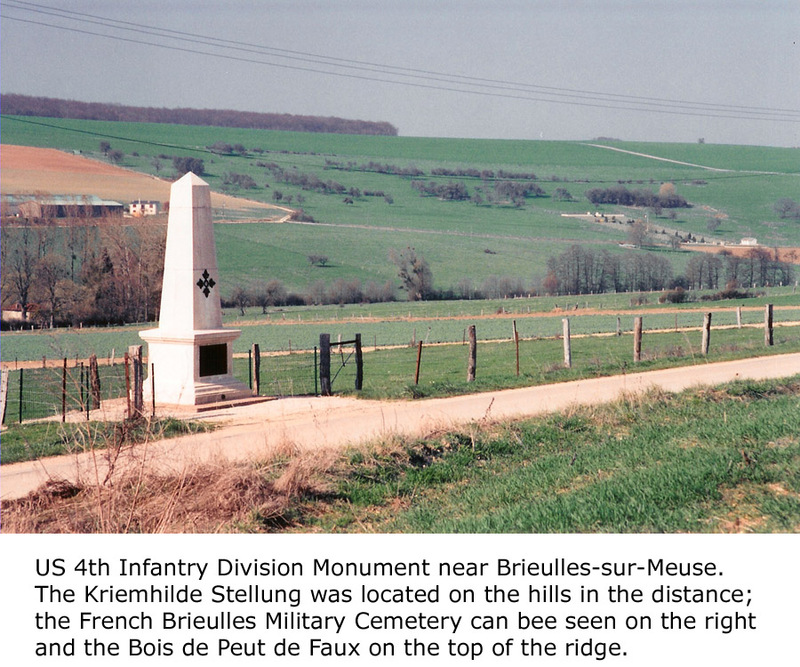 The engagement raged from 26 September to 11 November 1918 and, because of the geography, became known as the Meuse-Argonne Offensive. The combined French / American offensive was successful and contributed to the Germans seeking the Armistice which ended the war on 11 November. Fighting northward through Varennes-en-Argonne, the Americans confronted a series of strong German defensive lines, or Stellung, given the names Hagen, Giselher, Kriemhilde, and Freya after characters in Wagnerian operas. The third of these was the most extensive and presented attackers with an almost continuous 10-mile belt of machine-gun positions and barbed wire. The terrain provided numerous opportunities for mutually supporting cross- and enfilade-fire and it exposed attackers to shelling from artillery hidden in the forests. It was mid-spring 2005 and I had been in the area for several days reviewing the sites relating to the battle. 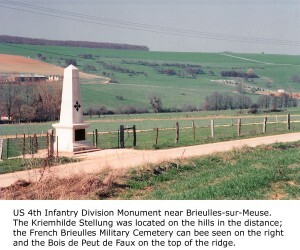 On one particular afternoon, I drove the roadways near Brieulles-sur-Meuse to view the Kriemhilde Stellung terrain. Beside the road was a stone monument to the US 4th ‘Ivy’ Infantry Division, which had suffered 7,412 casualties in the brutal local fighting. I wanted a photograph and, contrary to my normal policy of finding a safe, public area to park, I instead turned onto muddy, farm track. After all, it was a quiet afternoon and nobody was about.